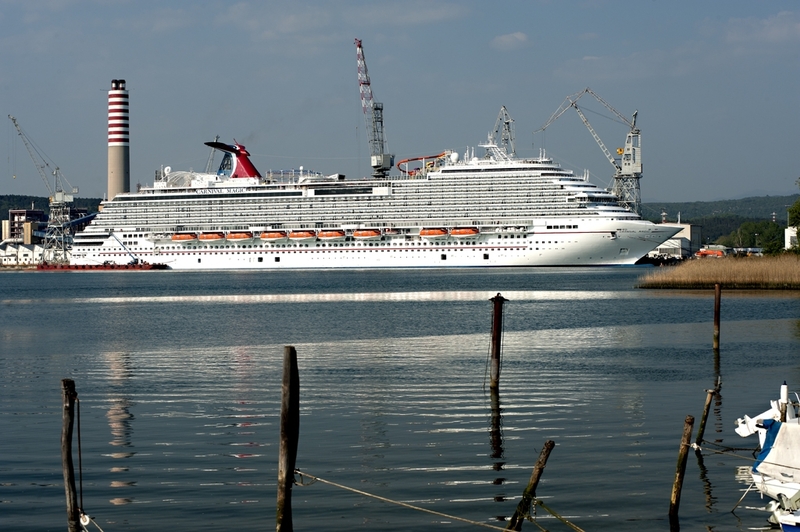 With just over two weeks until the debut of the new 3,690-passenger Carnival Magic, final preparations are underway at the Fincantieri shipyard in Monfalcone, Italy, in anticipation of the ship’s inaugural May 1 voyage from Venice. Workers are putting the finishing touches on the Carnival Magic’s dazzling interiors and public spaces and nearly 1,000 crew members are on board undergoing various training exercises and familiarizing themselves with the facilities and features aboard the new 130,000-ton vessel. As the line’s newest “Fun Ship,” Carnival Magic will introduce a host of innovations, including the Cucina del Capitano, a new family-style restaurant that brings the heritage of Carnival’s captains to the table; SportSquare, an expansive open-air recreation complex featuring the first-ever ropes course at sea; and the RedFrog Pub, a Caribbean-inspired watering hole with its own private label draught beer. Immediately prior to the May 1 inaugural cruise, Carnival Magic will be officially named by Lindsey Wilkerson, a former St. Jude Children’s Research Hospital patient who now serves an employee and an ambassador for the organization. Wilkerson’s choice as godmother is a tribute to Carnival’s ongoing relationship with St. Jude, one of the world’s premier centers for the research and treatment of pediatric cancer and other catastrophic diseases. Carnival Magic will operate a series of seven- to 12-day Mediterranean voyages through October then reposition to Galveston, Texas, in November to launch seven-day Caribbean voyages, becoming the port’s largest year-round ship.